Sunday will mark the one month anniversary of the day that the first reports began trickling in that a small chemical company called Freedom Industries had let between 2,000 and 5,000 gallons of a relatively unknown chemical used in coal washing called MCHM spill into the Elk River. In retrospect, this seems to be the high water mark for optimism in and around Charleston as nearly every day since has brought with it a seemingly endless supply of hideous revelations regarding the quality of their water supply, the quantity of the toxin that was dumped into the Elk River (More than doubled from the initial estimate to at least 10,000 gallons), and the inexhaustible incompetence of state and federal officials. 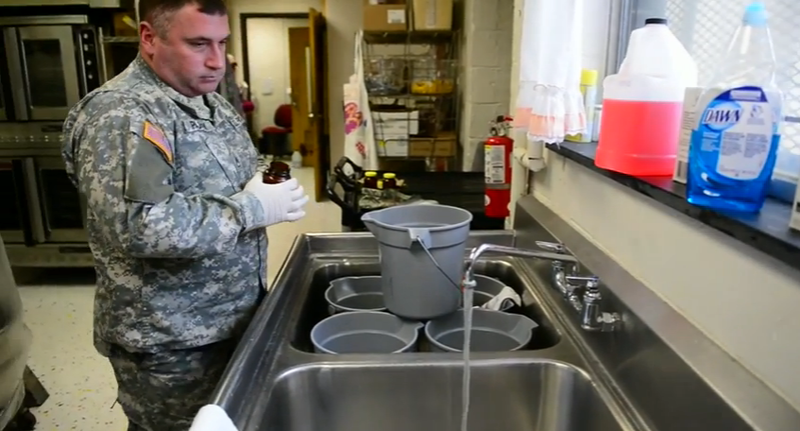 A National Guardsman Takes a Water Sample in the Kitchen of J.E. Robins Elementary in Kanawha Co, WV on Thursday. Over the past 48 hours, 5 schools in and around Charleston have been shut down and their student bodies sent home due to the sickly sweet anisette aroma of MCHM returning to their water systems with a vengeance that caused the eyes and sinuses of those near it to burn fiercely and, for one teacher, actually caused her to pass out from the smell. Naturally, these school closings happened on the very day that the CDC reaffirmed their stance that the water is safe for use, and acting director of the National Center for Environmental Health and Agency for Toxic Substances and Disease Registry, Dr. Tanja Popovic, remarked at a press conference concerning the region’s water safety that, “You can drink it. You can bathe in it…You can use it how you like.” Of course, the CDC, along with other federal and state agencies has steadfastly refused to test the water in people’s homes, so I think it has become pretty clear to the residents of West Virginia that a) officials from the CDC, EPA and West Virginia Department of Environmental Protection have no clue what in the ever-loving hell they’re talking about and b), they never had any desire to find that clue from the get-go. Now, I have been somewhat critical (rightly, I believe) of the national media in the paucity of their coverage of the West Virginia Water Crisis and, more recently, the massive (and I mean MASSIVE) coal ash spill in North Carolina courtesy of Duke Energy, but I must say that, of the 24 hour news crowd, Rachel Maddow deserves a special exemption from such criticism. Somehow, in the midst of the vast morass of blatant misinformation (everything at Fox News except for Shep Smith, who is just wonderfully unhinged), technological masturbation (I’m looking at you Wolf Blitzer) and tinnitus-inducing squabbling (every second Chris Matthews’ mouth is open), Rachel Maddow has somehow been able to make her name through the novel act of actually reporting on issues that are actually of political and social import and that are based in fact and research. It shouldn’t be a surprise to anyone familiar with The Rachel Maddow Show that she would be the one to pick up the mantle for the, in her words, “the ongoing large scale botch-job” that the response to the West Virginia water crisis has become. Below is an 8 minute segment from Rachel’s show last night, which describes in great detail the willing ineptitude of government officials in West Virginia and in Washington and the level of mistrust that the 300,000+ people affected by the spill have in their “leaders” who have spoken from places of authority about issues that they know next-to-nothing about, placing the health of hundreds of thousands of people in jeopardy. Also, if you’re living in any of the areas of the nine West Virginia counties that have been impacted by the chemical spill, Aurora Lights would love it if you could find the time to write down your experience in this Share Your Story Google Doc so that peoples voices can be heard. I live in West Virginia, right in the heart of the water crisis. Here is a post I wrote for my blog about life with the chemical spill-and Autism.